My daughter has had migraine headaches since she was very young. While she wasn’t able to be formally diagnosed until she was five years old, her pediatric neurologist agreed that she has had them at least since she was a toddler. He has taught me a lot about migraines in children, and helped me understand that they manifest and “look” different in children. I remember many times when she was as young as two years of age watching her hold her head, crying. The best remedy for the headache was for her to “sleep it off,” preferably in a quiet, dark room. When her headaches got to this point, she wouldn’t eat or drink anything, so taking medicine to help alleviate the headaches wasn’t a possibility. Fast forward to her at eleven, and she still deals with migraines on a regular basis. Over the years we have identified her triggers and tried many strategies to cope with them. Currently, she is trying biofeedback. One suggestion the biofeedback therapist (as well as other people over the last few years, including her neurologist) made was to consider eliminating gluten from her diet. Her daughter had migraines when she was younger, and this dietary change seemed to make a difference for her. I asked my daughter what she thought of this suggestion on our way home, and she said, “Oh, I couldn’t do that! I love my gluten. I can’t give it up.” She was familiar with what products did and didn’t have gluten as it has been a topic in our household over the years. I dropped the subject. Today marks a month of my daughter and me being gluten-free. I have to admit that at times this decision has been hard, but overall it hasn’t been that big of a deal. My daughter has spent time reading about the benefits of being gluten-free, and thought hard about options of what she can eat on a daily basis, especially what to prepare for her school lunches. Many restaurants offer gluten-free menus, so dining out hasn’t been that much of a challenge. We have both sought out ways to create some of our family favorites like cookies and waffles with gluten-free flour. I even made scones the other morning that, I believe, were even better than the ones we have made for years. Another positive change is my daughter’s awareness of the food she is eating. She now brings two lunch boxes to school as she is packing more fresh vegetables and fruit, all things that take up more space. We have made a variety of protein smoothies for her breakfast (I haven’t quite convinced her to add anything green to them yet) and have found great options for snacks. Overall, she has adapted well to this new way of eating, and doesn’t have a desire to go back to eating gluten right now. And the best news is that she has only had three migraines in the last month — welcomed improvement! I am definitely proud that she is taking control of her health and making decisions that are good for her. I look forward to her recognizing even greater results in the coming months. I am a wife, mother, and children's book author. Since I was eight years old, I knew I wanted to write books and have always loved reading. I enjoy learning of good book suggestions for children as well as sharing suggestions from my family's bookshelf. I love being a mom and am always open to learning more about being a better parent. I appreciate insights and experiences from other parents. Together we can all be more mindful moms (and dads, too!). 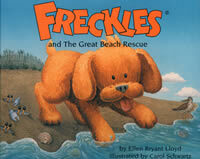 I write the FRECKLES children's book series about a little puppy named Freckles and all of his adventures. Freckles teaches children important lessons and encourages them to believe in themselves. For more information about my books, please visit my website: www.funwithfreckles.com. A Mindful Mom · Musings of a mom who strives to be mindful as she walks through life.